Often, when you think of the role of a paralegal, things like drafting documents, scheduling meetings, and taking notes come to mind. But that's so 20th century. In reality, the role of paralegals is rapidly evolving, with traditional responsibilities being augmented or even replaced by new focus areas and opportunities for advancement. E-Discovery is playing a significant role in these changing responsibilities. More and more, in-house e-discovery teams require a dedicated project manager to coordinate operations between the team members with more specialized roles, namely attorneys and IT experts. Often this role is filled by paralegals, many of whom bring the best of both worlds to the table: a background in law and legal procedure along with tech savvy, making them perfect for the job. 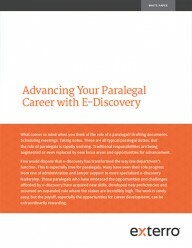 Two corporate paralegals who were able to leverage their focus on e-discovery into an expanded role are Tara Jones, Legal Services Manager for Oath, and Ellen Kuplic, Director of Legal Learning and US Legal Operations for BP Legal, whose insights are highlighted in Exterro's white paper, “Advancing Your Paralegal Career with E-Discovery." E-discovery projects rely on contributions from an array of professionals who have other day-to-day responsibilities, so roles and responsibilities must be clearly and carefully defined, or work simply will not get done. Paralegals function as the glue that binds the team together. There are various ways companies handle the role breakdown. Some opt for more specialization, where specific members of a given team, whether it’s legal, IT, or a particular business unit, are responsible for e-discovery activities. Other companies take a broader approach and expect a variety of people from each department to be proficient in e-discovery and prepared to handle requests as needed. There isn’t one right answer as long as the system in place supports workload demands and the roles and expectations are strategically defined. Having a well documented process helps ensure that individual tasks get done correctly and efficiently, and it should be process-specific and highly detailed. Think of it as a playbook of sorts. Keep in mind, people switch roles, leave the company, and systems are constantly changing; the playbook helps to ensure that when people are thrust into new roles or forced to engage with new technologies they at least have some authoritative resource to help guide the way. But the playbook can’t be static. Make it a priority to review and update it on a regular basis. Seek feedback from the larger team on what works and what doesn’t, or if any process changes have been made on the fly that have yet to be reflected in the playbook. The same goes for any new systems that have been incorporated into the process, such as a legal hold or collection tool. As a rule, any time a new technology is brought in, you should review the playbook and make updates as needed. Exterro's Comprehensive Guide to E-Discovery Workflows is a great place to start if you're looking to nail down roles and responsibilities. How have roles and responsibilities changed? Are certain steps under the old process now rendered obsolete? Can previous isolated tasks can be consolidated into one action? It’s very important that all of this is considered proactively, as a poorly planned roll-out can very easily turn people against a new technology and result in your team relying on workarounds that threaten process cohesion. And let's face it, bringing new technology into your legal department can, in itself, be quite a challenge. It requires buy-in up and down the org chart, as well as in the IT department. Fortunately, if you don't know how or where to start that process, Exterro has the resource for you. As companies increasingly look to bring E-Discovery in-house, the opportunity for paralegals to assume a position of leadership in the legal department is only expanding. But with an expanded role comes more challenges and greater responsibility. By focusing on process consistency and technology adoption, you can become the linchpin when it comes to E-Discovery, both for your team and for the larger enterprise.